More than 700 persons turned out Monday, January 21, 2019 for the 35th Annual Dr. Martin Luther King Jr. Community Leaders’ Breakfast at the Ted Constant Convocation Center in Norfolk. 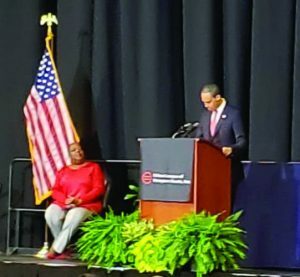 The event at the Ted Constant Convocation Center in Norfolk was keynoted by the Honorable Jerrauld “Jay” Jones, Virginia House of Delegates. Sponsored by the The Urban League of Hampton Roads, Inc. and Old Dominion University, the 2019 theme was Legacies: Celebration of Unity, Service and Leadership. Six community leaders were honored during the breakfast: Sara Carroll, CEH, Executive Director for Sara’s Mentoring Center, Inc., and owner of A-1 Environmental Services; Inc.; Dr. Amy Milligan, Assistant Professor, Women’s Studies, and Director of the Institute of Jewish Studies and Interfaith Understanding, at Old Dominion University; Barbara L. Willis, CEO of Hampton Roads Community Health Center; Dr. Narketta Sparkman-Key, Assistant Professor, Counseling and Human Services, at Old Dominion University; Cardell C. Patillo Jr. Youth Pastor and Community Leader; and Donovan Stokes, Student.